Design a gorgeous bookmark that you’ll be proud to slip between the pages of your favorite novel. Whether you’re a bookworm who simply adores bookmarks with beautiful designs featuring cute illustrations, popular bookish quotes and more, an author looking to create book swag for your readers or a company promoting your name and business, Canva’s Bookmark Maker is perfect for you. 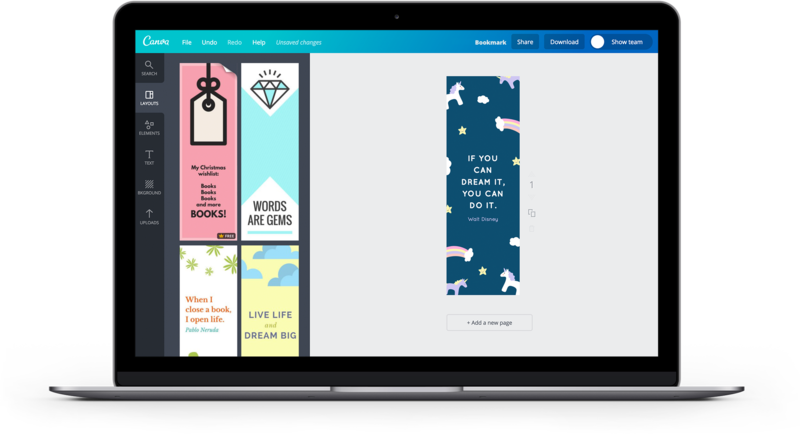 Canva takes the complications out of designing so whatever your design level, you can easily create a bookmark that reflects your own style. Thanks to intuitive drag and drop tools and a vast library of professionally designed layouts and elements, you’ll be able to create awesome bookmarks in just a few clicks. Create unique bookmarks in 5 easy steps. Create a new Canva account to get started with your own bookmark design. Customize your bookmark with a few clicks. Want a cute kitten to greet you every time you pick up where you left off? Or how about a famous landmark that goes with your book’s setting? Search for these and more using Canva’s impressive media library which hosts over a million photos, illustrations, and vectors you can use on your bookmark designs. Each photo is carefully reviewed and curated so you only get the best choices. There are also plenty of free images to choose from. To browse for free images, head over to the Element tab and select the Free Photos folder. Meanwhile, at $1 a pop, using premium images won’t break the bank either. One of the best parts of designing in Canva is that you don’t have to design from a blank page (one of the most challenging parts of designing). Instead, you can browse through Canva’s wide selection of beautiful, ready-made bookmark templates and choose one that inspires you the most. From there, you can customize as much or as little as you want. Recolor text and elements, move them around, resize them, change images and quotes. You’re only a few clicks, drags, and drops away from the perfect reading companion. And if you want to create another bookmark with the same layout, simply duplicate your saved design! Once you’re happy with your design, it’s time to bring it to life! Save and download your new bookmark as a high-quality PDF for printing. You can also show off your design on your favorite social media channel by clicking on the ‘Share’ button to post your design directly on Facebook or Twitter. Want to make changes or edit on the fly? Access all of your designs on your mobile device by downloading our free Canva iOS and Android apps from the App Store or Google Play. If you’re an author or budding writer, bookmarks are the perfect way to promote your name and your literary works. Make the colors of your bookmark similar to your book covers to create a consistent aesthetic. Add your personal logo to your bookmark design or feature a character or quote from your books. With Canva, it’s easy to come out with book swag that your readers will surely treasure. Can I edit my bookmark design after I’ve saved it? You sure can! In fact, you can edit and save your designs as many times as you like. Every time you create a new design, it will appear in the “My Designs” section of your Canva homepage. You can even use an existing design as a template. Simply go to File, click Make a copy, then add your edits to the new file. There are watermarks on my bookmark; how can I remove them? How can I add branding to my bookmark design? If you’re planning to give away bookmarks as a branding promotion, you can create designs that are instantly recognizable by uploading your logo, using your brand color palette and consistent fonts. To upload your logo, click on the Uploads tab in your object panel, select the Uploads folder, and click on the green Upload your own images button. Select any PNG, JPEG or SVG file you wish to upload from your computer.